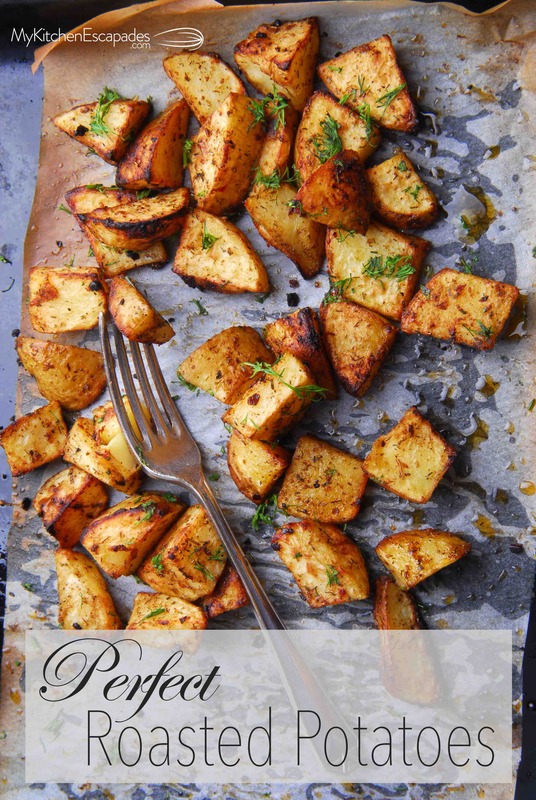 I made this recipe for the first time last year and my teenage son’s first comment was, “Since when do we eat butternut squash?” Honestly, I have tried other ways of using butternut squash but was never a fan because I thought it always tasted too much like pumpkin, which I despise. Yes, despise. 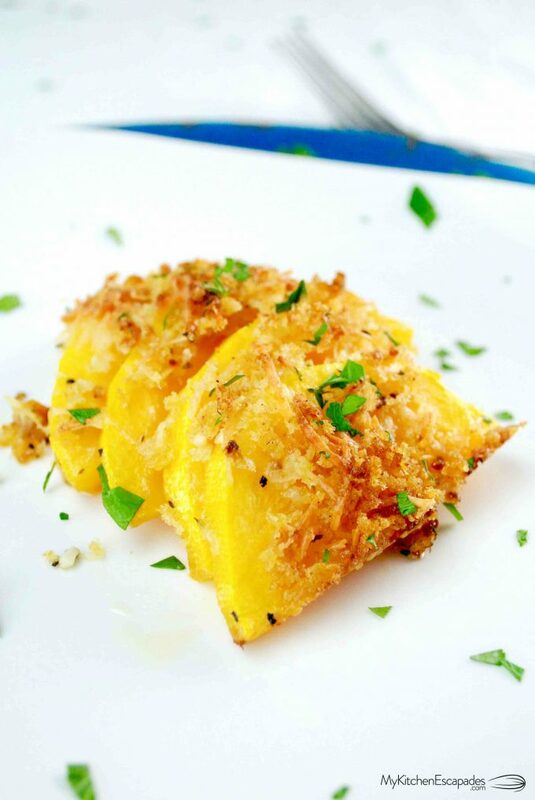 This roasted butternut squash gratin completely transformed my opinion. 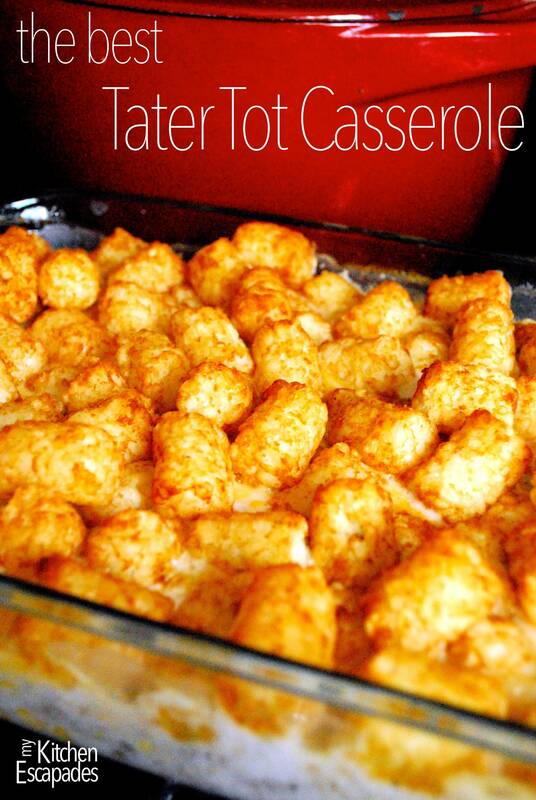 I think the generous use of garlic really helped mellow the sweetness so it became a perfect savory side dish. I know many of you have no idea how to cook butternut squash so it sits on your counter as a fall decoration until it becomes moldy. 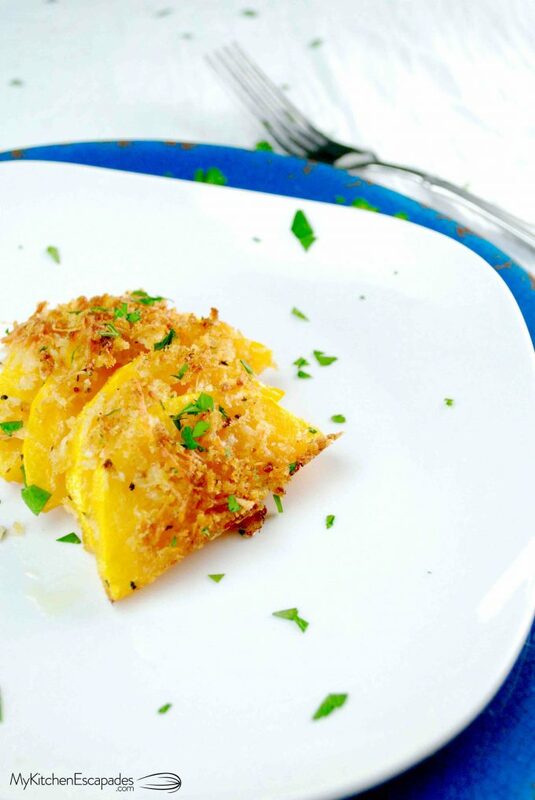 Promise me you will give this easy recipe for butternut squash a try. 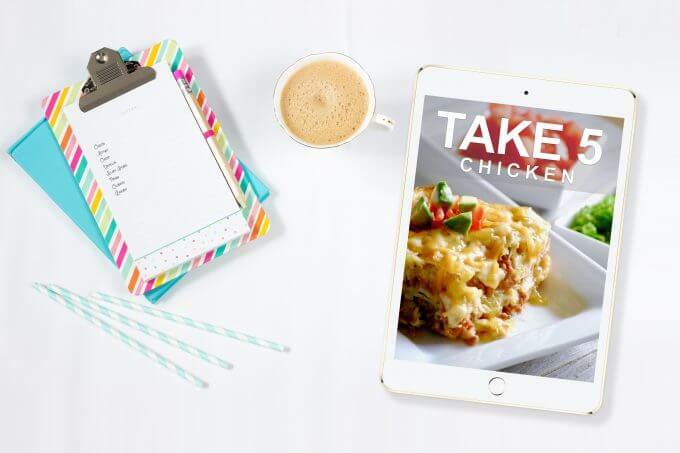 If anything is going to make you brave enough to try a new vegetable, this crunchy, cheesy gratin topping is always a great place to start. 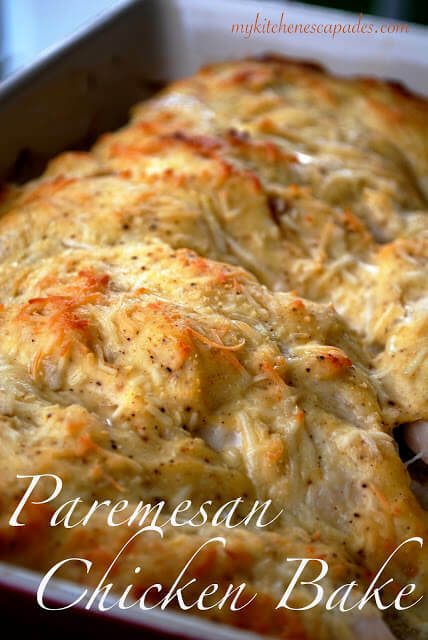 This recipe really does come together super fast and makes a gorgeous side dish so keep this bad boy in mind as we get closer to Thanksgiving! Take a peek at my quick video to see it come together before your eyes! Now, if you are going to learn how to cut a butternut squash, your first step is to have a quality sharp knife. If you try to cut this beast with something flimsy and dull, you are going to end up cutting yourself. After you peel the squash, just cut off each end so that you have two flat surfaces to cut from. Stand the squash up on the fat, flat end then cut from the flat top all the way down the middle to the bottom. Viola….one perfectly cut butternut squash and you still have all 10 fingers. If you still aren’t quite sure, just click on the video above which shows you step by step how to cut a butternut squash. 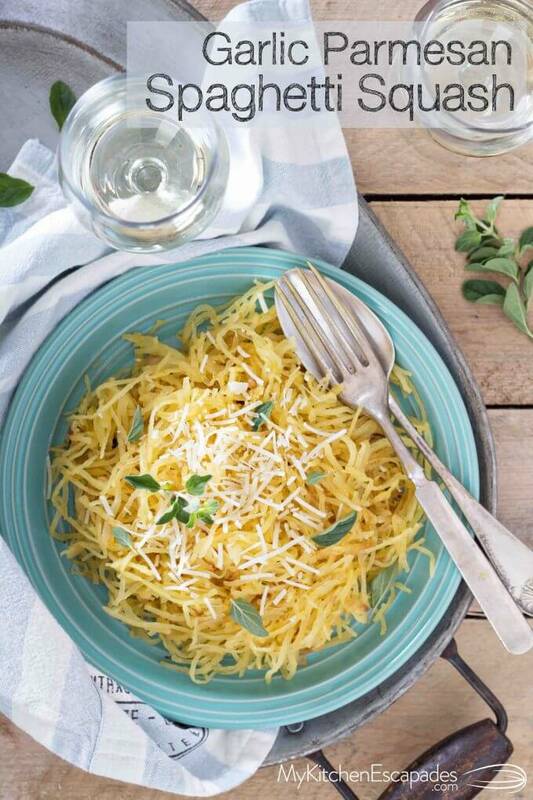 If you love squash, then go grab my favorite recipe for Garlic Parmesan Spaghetti Squash before you forget where you saw it. This stuff is amazing! 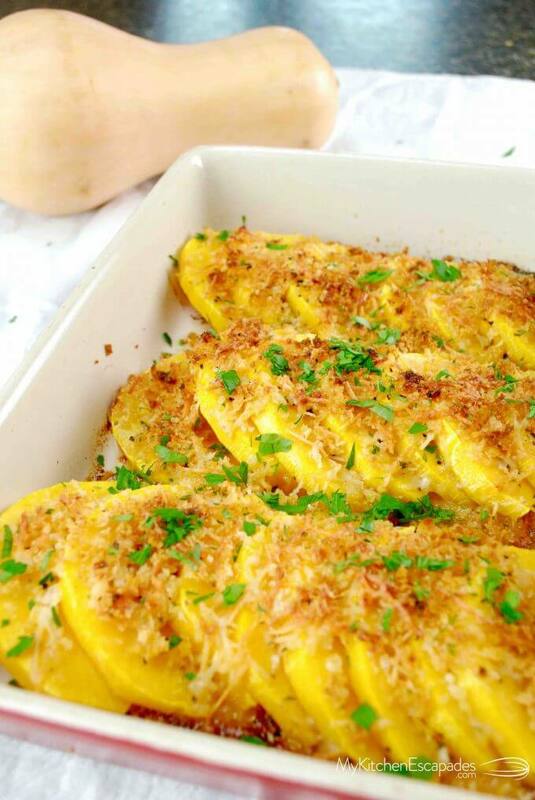 A healthy side dish recipe using butternut squash, that you roast in the oven with a garlic and cheesy gratin topping. Preheat your oven to 375 degrees and spray a glass baking dish with nonstick spray. Peel the butternut squash, then cut it in half, removing the seeds. Slice in 1/2 inch slices and arrange them in the baking dish. Melt the butter in the microwave then add the minced garlic. In a medium bowl, toss together the panko bread crumbs, parmesan cheese, and 1 Tb of the garlic butter. Use the remaining butter to spread over the sliced squash the season it with the salt and pepper. Evenly sprinkle the squash with the bread crumb mixture. Bake for 30- 40 minutes until squash is tender, then increase the temperature to 425 and bake another 5 minutes until golden brown on top. 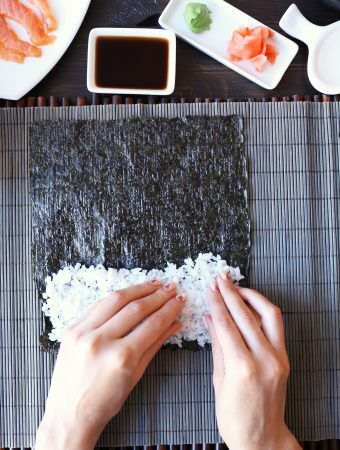 Sprinkle with fresh parsley before serving. Love squash this is really wonderful the family wants this again soon. Love hearing that! We make it all the time in the fall.